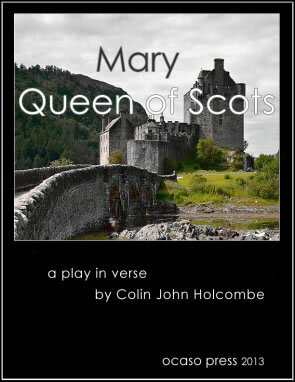 A play in verse that brings to life the turmoil of Mary Stewart's last years in Scotland. By circumstances, character and upbringing, Mary was incapable of ruling her inheritance. She had none of the political cunning, the dissimulation, or the ruthlessness needed for such difficult times. Though she had arguably the greater claim on the English throne, through her grandmother, Mary made no moves to threaten Elizabeth, accepting the Protestant conversion and pointedly not supporting the Catholic aristocracy—a policy of even-handedness that eventually cost her the support of the Catholic nobles and so the throne. Mary made serious mistakes. Her first was to choose Lord Darnley: a good-looking young man with claims to the English throne whose arrogance alienated the leading families —which is no doubt why Elizabeth sent him. But Mary fell in love with the preening youth, married him and had a son before his less savoury aspects became impossible to overlook. Bothwell and other nobles murdered the offender, possibly with Mary's connivance. Bothwell then kidnapped Mary—with what acquiescence again isn't known, but requiring a hasty marriage to preserve Mary's honour. Yet Bothwell was no more acceptable than Darnley had been, to the nobles, the populace and probably to Mary herself in time. An uprising against the two followed, the promised support from the Hamiltons and others never appeared, and Mary was forced to surrender for Bothwell's safe passage from the battlefield. The rebels reneged on the terms of surrender, imprisoned Mary in the Douglas stronghold at Lochleven, and forced her to abdicate. From here, in yet another reversal of fortune, and with the help of her gaoler's dashing young brother, Mary escaped, raised an army and seemed likely to regain her throne. But treachery once again intervened when Argyle went over to the other side. Mary fled the battlefield and took refuge with Catholic lords in south-west Scotland, where she made another of her ill-judged decisions. She crossed into England and threw herself on the good offices of its queen. But Elizabeth refused to meet her, illegally kept Mary a prisoner for eighteen years, and allowed her to be drawn into the treasonous Babbington plot, for which Mary was executed at Fotheringhay Castle in 1587. The play in free ebook format, which includes notes on the characters and historical setting. The text may be used free of performance royalties if the author is acknowledged. as cannons echoing from harbor walls. is foreign to them as a well-phrased thought. in punishment and so have wrongs redressed. By wealth and family is worth assessed. was never slow to claim its lofty place. 20. the least of her ill-favoured brood instead. than plan and soberly secure its power. of wooing subjects for their threatened pope. who looked for offspring from that grafted stem. 30. she was committed, body, heart and soul. have ever captured Mary's topaz eyes. a-boy, with all the ferment of her girlish will. may fall as thunderclap to opened eyes. by choosing spinster-like, in haste and late. to us, from strained imaginings, if such they are. of Paris, that could only gasp and stare. the most inveterate of bitter foes.